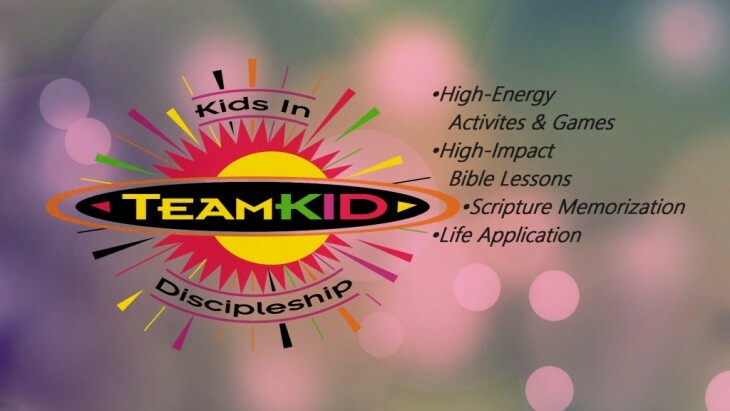 TeamKID is a fun, high-energy ministry that encourages kids to know Jesus Christ and grow in a relationship with Him. It teaches kids character traits that God wants them to develop. Ranging from being honest to being joyful, the topics each week challenge children to make that character trait part of their lives. TeamKID is designed for children to do more than just memorize Scripture. It helps children understand what the verses they memorize mean and understand how to put those verses to action in their lives. Bible study, memory verse, missions, refreshments, and Worhship all contribute to help children understand and apply God's Word to their lives.